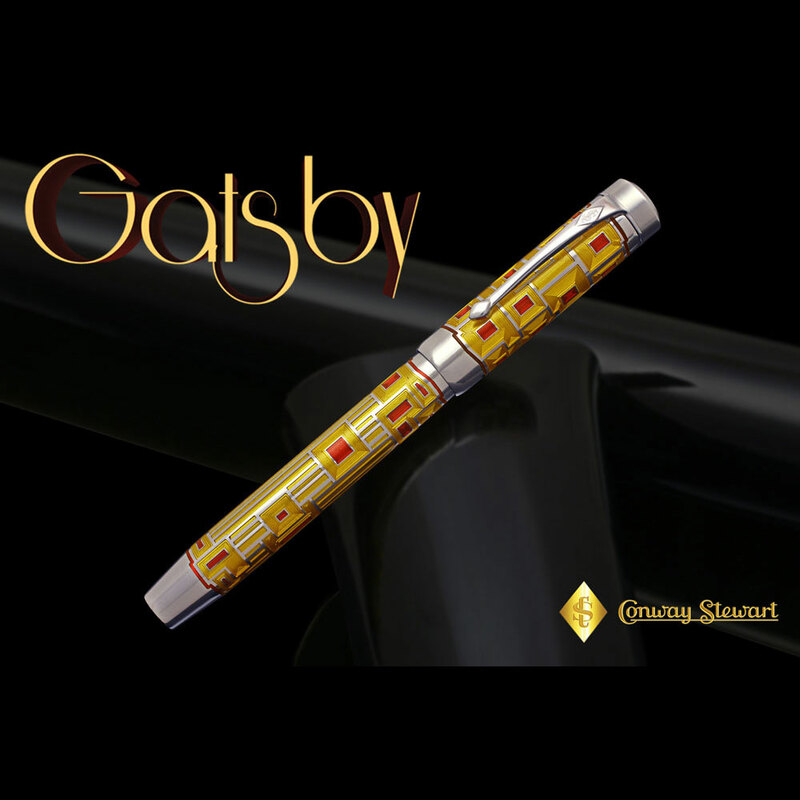 Conway Stewart Gatsby Pens are crafted from a solid rod .925 silver and decorated with enamel. The hallmarked solid sterling silver construction of cap, barrel and front section of the Gatsby limited edition is set off with our popular 18 carat gold nib, accented with rhodium plating, available in a choice of eight nib grades allowing the ideal choice for your individual handwriting style. Ink is delivered via the reliable converter cartridge system. 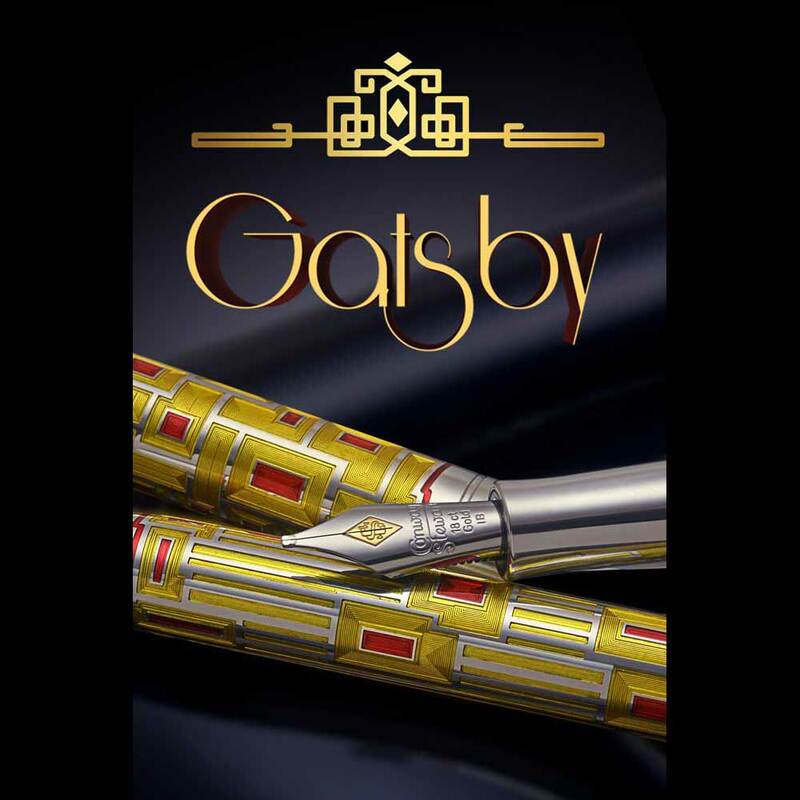 The Gatsby is a substantial pen, crafted with an eye to providing not only a first rate appearance, but to also be comfortable and well balanced in the hand when in use. This makes the Gatsby as much a pleasure to write with as it is to look at: A perfect combination! Our goal with this design was to bring back the sense of style and bustling energy that epitomized the Art Deco era. Beginning with a time honored flat top shape drawn from vintage pens of the golden age of fountain pens, we carefully crafted a shape and size that would balance in the widest range of hand sizes. Using an intricate interlocking design forming lines, rectangles, and squares on both the cap and barrel, the Gatsby is a classic embodiment of the bold new style that first came to life during the 1920s. The choice of Hallmarked solid sterling silver for cap and barrel, polished to a gleaming lustre serves as a counterpart for the deep red and yellow colours chosen for the hand applied enamel work. The result is bold, stylish, and sure to draw comment whenever it is used! The art of enamel to decorate precious metal has been a much loved European tradition for many centuries. 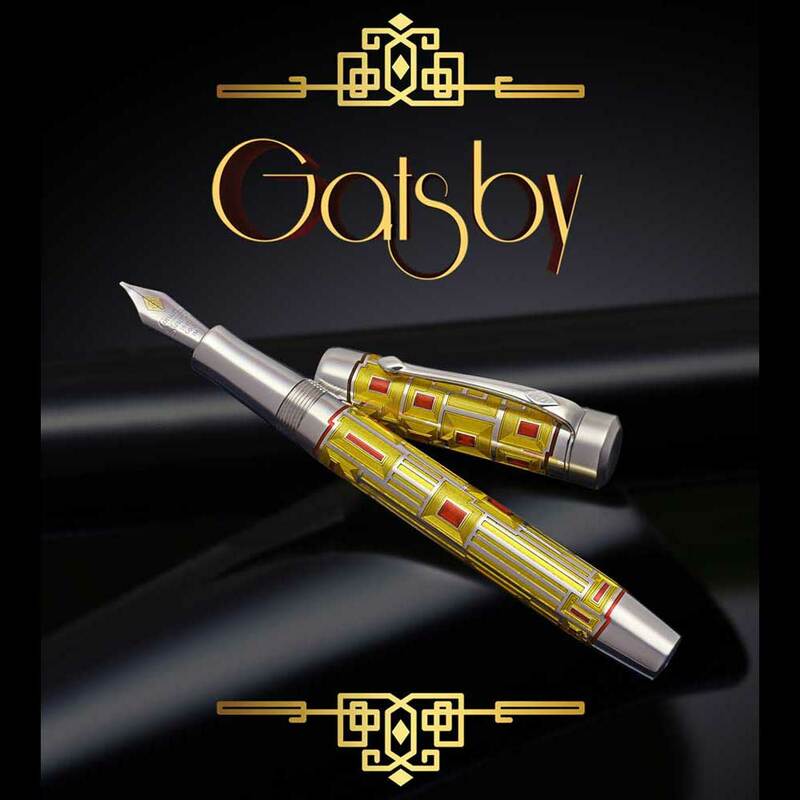 It proved to be the perfect choice for bringing the delicate engraving design used on the Gatsby to vibrant life. Rich bright red accents gleam from among the vivid yellow background that covers cap and barrel. Through the translucent enamel the crisp deco design of the engraving comes to life, with each movement of the cap or barrel under the light revealing a new aspect of this stunning design. Conway Stewart prides itself in its working relationship with the best of English craftsmanship. The artist for our precious metal enameled series is known for his creativity and design in jewellery, plaques and trophies. Robert Glover M.A. RCA, has been published in numerous industry titles and is the recipient of many notable awards and presentations. His works include major television awards, the famous and iconic Brit-Awards trophy for the UK music industry, exclusive corporate and military presentations. Glover's previous commissions include presentation pieces for the chairman of Hyundai ship building company, HRH Princess Grace of Monaco, the Cunard Lines Flagship QE2, as well as Silverware for Royalty and Regimental silverware for the Parachute Regiment and the Brigade of Guards. Our pens are hand crafted in Britain using only the finest materials. Over 233 individual steps are involved in the creation of one of our fine writing instruments. Our craftsmen pride themselves on the meticulous attention to detail from the selection of solid sterling silver rods, the application of enamel by hand, to the final hand polishing of each writing instrument. All of our precious metal writing instruments are engraved with the British hallmark, the world standard for .925 sterling silver or 18 carat solid gold.